The first RaDAR Challenge this year was April 6th. 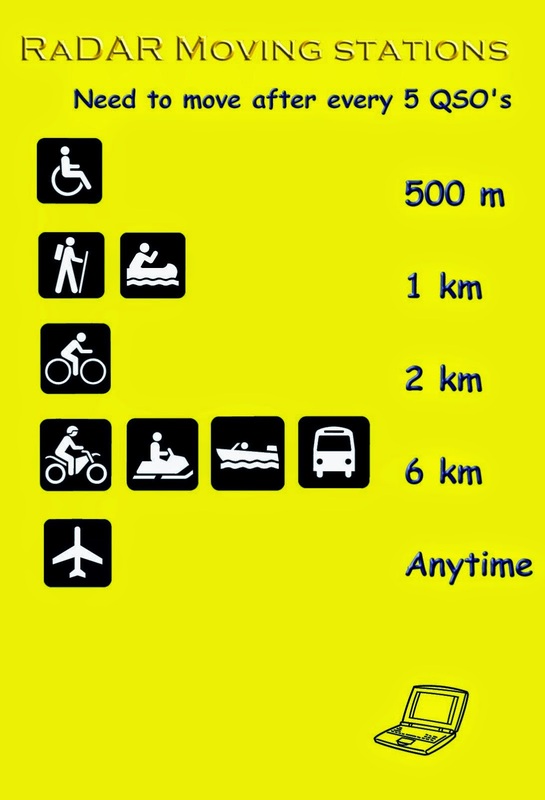 For RaDAR, Rapid Deployment Amateur Radio, you make five contacts and move a prescribed distance to the next location. This is repeated as many times as possible during a four hour period. This year to try something new, Dennis and I used mountain bikes to move between locations. I had not been bike riding in many years. 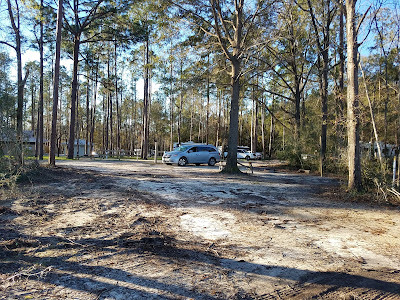 I rented a couple of mountain bikes for the challenge.We chose Topsail Hill Preserve State Park in part because it has nice paved trails around the park. I chose the Elecraft KX2 and the Alexloop magnetic loop to keep it light and minimize setup time. All the gear fit in our backpacks for the bike ride.I generally have good contacts with the Alexloop even on 40 meters. However, dismal band conditions made it a struggle to make the five contacts. At the first location I tried a AO-92 FM sat pass to no avail. This is not uncommon due to the congestion on the weekend passes. On HF, we picked up three Missouri stations, one on 20 CW and two on 40 CW. 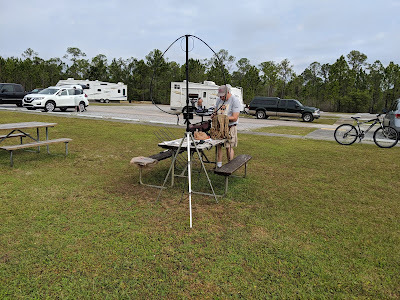 Fortunately, Glenn KD2JA was in the same park working the Florida State Parks On The Air Contest and gave us a local contact on 40 and 2 meters to finish out the five. Then, we did the two kilometer bike transition to the next location in the park. The bands were still poor. 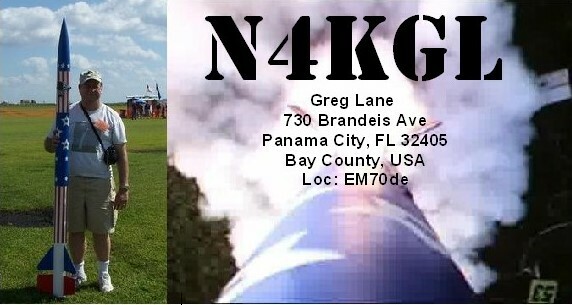 We got one QRP contact on 20 meters to Tennessee and two more contacts with Glenn KD2JA in the park. Our four hours ran out before we got five contacts. This is the first time we did not do at least three locations in the challenge That's the way it goes. To make the best of the day, Dennis and I took a ride after the challenge and went on an dirt trail. That was fun. Perhaps we will incorporate bikes in our RaDAR routine more often. Click the image above for a panoramic view of the lake taken by Dennis. Dennis WA6QKN and I do the RaDAR Challenge together. We are going to use bikes to move between stops this time. The prescribed distance is two kilometers. I am not a regular bike rider. I did rent a bike last weekend and rode a couple of kilometers. I found out I am not in RaDAR shape as I huffed and puffed over the hill. However, if I stick to the flat roads I should be fine. For a venue, the Top Sail Preserve State Park near Destin Florida is high on the list. The trails are paved. It has a beach and a lake for the scenic view. For the RaDAR challenge, you pick a four hour period within the 24 hour UTC day. It turns out we will overlap the annual Florida State Parks On The Air Operating Event. Our park will also be on the Parks On The Air POTA reference list. We will need all the help we can get to get our five contacts before each move. The gear will likely be the Elecraft KX3 running ten watts. The main antenna will be a Windcamp Gypsy adjustable dipole with fiberglass support poles. They get the antenna about ten feet above the ground. 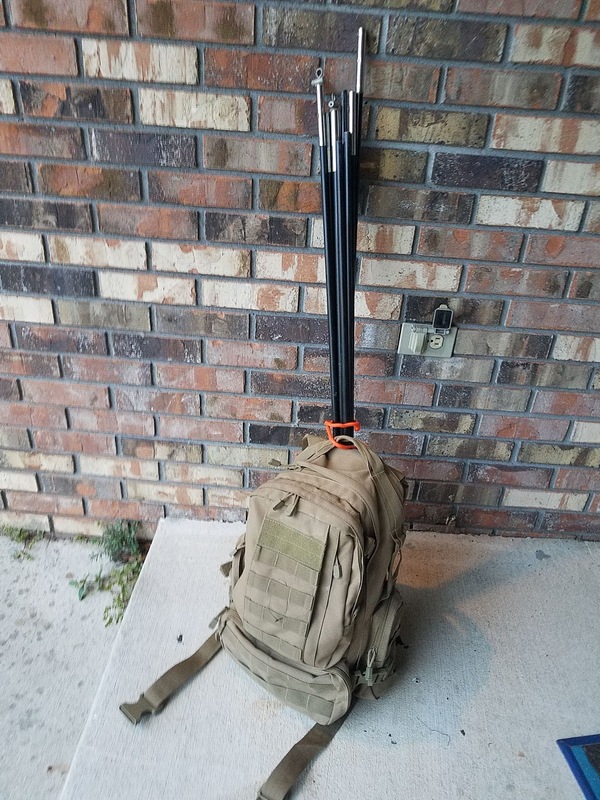 I can slip the support poles into my backpack as shown. Of course, we will also take an Elk antenna and an FM HT for the RaDAR satellite bonus. 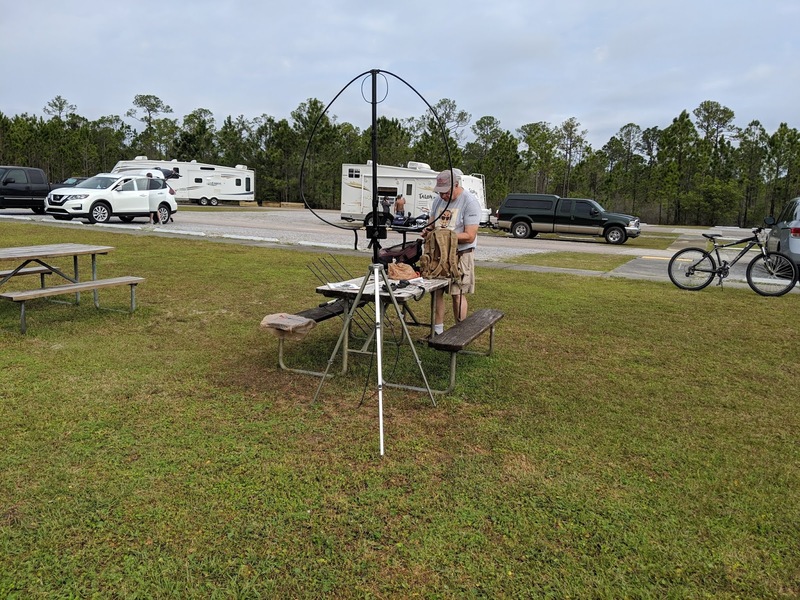 The RaDAR “Challenge” is a unique event aimed at promoting the use of Rapidly Deployable Amateur Radio stations. Categories (Fixed / Field / Moving) may be changed at any time during the challenge. The points system is so structured as to encourage portable RaDAR operations especially moveable RaDAR stations. RaDAR operators are encouraged to be self-sufficient during each challenge, with not only power supply and communications equipment but food, water, protective clothing and shelter. RaDAR operators define their own operating time schedule. It’s up to each individual to plan his / her MAXIMUM, SINGLE PERIOD, FOUR HOUR ops. He / she should consider propagation with the ultimate goal of inter-continental RaDAR to RaDAR communications in mind. 00:00 UTC to 23:59 UTC on Saturday 6 April 2019, Saturday 13 July 2019 and on Saturday 2 November 2019. Twenty four hours will give equal opportunity to the international community of RaDAR operators. All amateur bands are allowed including cross band contacts via amateur radio satellites. Modes – CW, SSB, FM or any legal amateur radio digital mode. As from 2019 the WARC bands will be INCLUDED. The RaDAR Challenge is not a “contest” as such, it’s an individual challenge. QSOs via terrestrial FM repeaters should preferably not be used for the purpose of the challenge. The RaDAR challenge requires more than a minimalistic information exchange. Accurate information exchange is considered more important than a large QSO count. Call sign, name, RS (T) report and grid locator. The grid locator of six characters is acceptable but should preferably be accurate to 8 or 10 characters for higher position accuracy (especially for moving RaDAR stations). Note (Changes for 2018) : Moving RaDAR stations need to make five QSO’s before moving to the next deployment point, thereafter they are required to move to their next destination. The move needs to cover the required distance before further contacts can be made. This requirement tests the ability to rapidly and successfully re-deploy your amateur radio station. If it be gentlemanly to make further QSOs before moving then please feel free to do so but the QSOs in excess of five per deployment point can not be counted for points. Five (5) points for a minimum of one satellite OR digital modes QSO involving a computer, smart phone or digital modes device. (For clarity thereafter 1 point per Satellite / Digital modes QSO). Ten (10) points for the first successful inter-continental (DX) RaDAR to RaDAR QSO. Log sheets must be submitted by 13 April 2019, 20 July 2019 and 16 November 2019 and sent by e-mail to edleighton@gmail.com Note: A photo of the station should accompany every log entry including each new location that moveable RaDAR stations visit. The results and photos are used to promote RaDAR and amateur radio. Please visit http://radarops.co.za/ zs6bne.wordpress.com and MeWe RaDAR Community for more info about RaDAR. Our two transmitter Winter Field Day at Falling Waters State Park, Florida went to plan with the exception that Bob KK4DIV and Tom WD0HBR could not attend. The attendees included Phil N4STC, Marv KK4DKT, Melissa KK4SYL, Chris VA3ECO, Dennis WA6QKN, Bob WB8PAF, Greg N4KGL, and Greg's XYL Linda. The temps were cool and dipped to freezing Sunday morning, but it was tolerable. We enjoyed pizza on Friday night. Chris VA3ECO brought Margot's Chili for Saturday night. Chris cooked breakfast each morning with eggs and sausage. Phil N4STC cooked Bubba burgers for lunch. We had a great time telling stories Saturday night around the campfire. Band conditions were good with plenty of WFD stations to work. We made contacts on CW, phone, and digital on 80, 40, and 20 meters. On 15 meters we got CW and digital contacts. Therefore our multiplier was eleven, Our contacts were 56 on digital, 46 on phone and 38 CW. We worked 40 states and Canada. Chris made a contact on the CAS4A linear satellite for 1500 bonus points. Phil ran an Icom 7300 with a loop antenna. Greg ran an Icom 7300 to a myantennas.com 80-10 end-fed antenna. Chris used his own laptop and Yaesu 857 for the digital contacts. The Winter Field Day event continues to grow. I am sure we will come back next year for more fun. There are more photos here. A group of my ham friends, their family members and I will camp and participate in Winter Field Day using call sign N4Y at Falling Waters State Park. The park is near Chipley, FL. We have three campsites reserved. Campsite 5 has plenty of space and borders a large field. We can extend an end-fed antenna into the field. Campsites 11 and 13 are adjacent which will make more room for antennas. We anticipate running two stations. We will be 2O or 2 Oscar for two transmitters/outdoors. Our rigs will be on battery/solar power. We will use CW, SSB and PSK-31 digital. We will also go for the amateur satellite bonus. Temps will be in the 50s in the day and the 30s at night. That's is a Florida Winter. 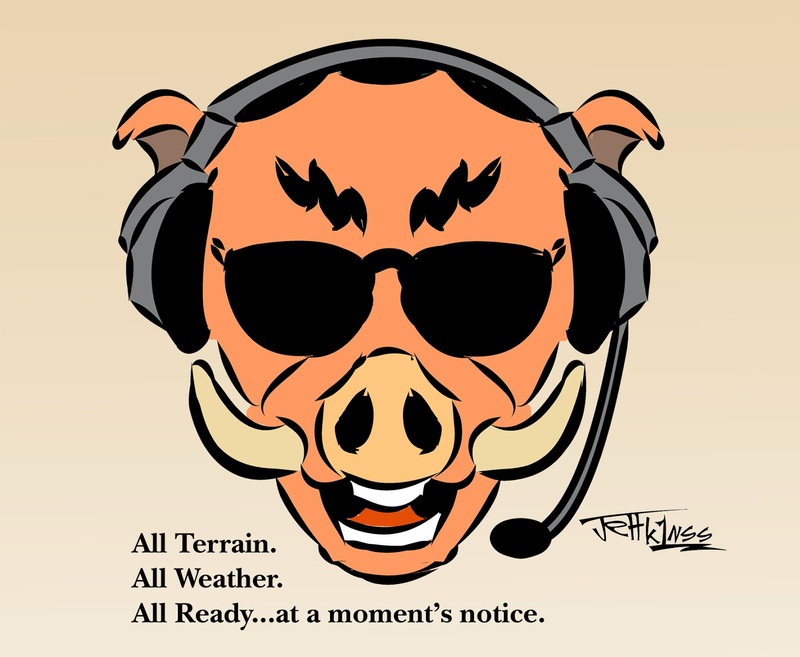 Purpose: To foster Ham camaraderie, field operation, emergency operating preparedness, and just plain on the air, outdoor fun in the midst of winter for American, Canadian and DX Amateurs. Don’t let those winter doldrums keep you locked up in the house… get out and play some radio!! 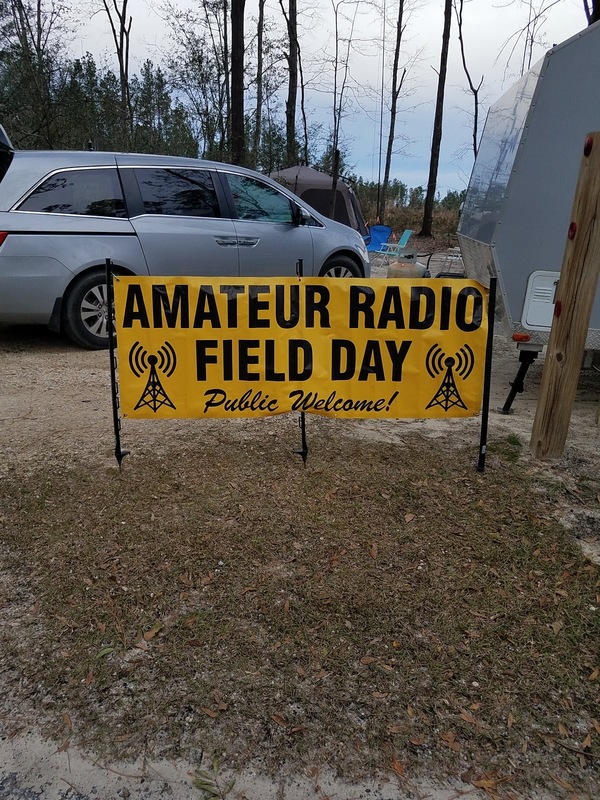 When: Winter Field Day runs for 24 hours during the last full weekend in January each year from 1900 UTC (2pm EST) Saturday to 1900 UTC (2pm EST) Sunday. For 2019, the dates are January 26th and 27th. Station set-up may commence no earlier than 1900 UTC (2pm EST) on Friday, January 25th. We are hoping for a big on the air turnout. The event seems to grow each year. Note there is limited parking. If you plan to visit please park at the main parking lot and hike in or let us know and we will shuttle you into the campground.